This week is ca-razy. We were out of town last weekend which always throws me off and Jack’s birthday is this coming weekend and between all that MY FRIEND CASSIE HAD HER BABY!!! Little baby Olive was five weeks early and has needed some help adjusting to the world via the NICU. I’ve been busy fretting and ooohing and ahhhing at pictures and trying to help however I can. She was born on Sunday but I wanted to wait until Cassie and Nic had a free moment to put it on facebook before mentioning it on my blog. I wish I could show you pictures of her beautiful face but out of respect for their privacy I’ll wait until they make those pictures public themselves. Suffice to say that even though I have yet to meet her in the flesh I am absolutely smitten, and so proud of my dear friend for weathering a difficult situation with strength and grace (and Grace just happens to be little Olive’s middle name, fittingly). Gosh they are just an amazing little family. So anyway, Jack’s birthday is on Saturday and we are halfheartedly preparing. The house is a mess and I haven’t bought any food, but something tells me it’ll all come together just fine because the really important thing is that my baby is turning one. I can’t believe it. We’re keeping the decorations simple, but I had an idea to bring in a little color for the food table with some oversized confetti cut from tissue paper. 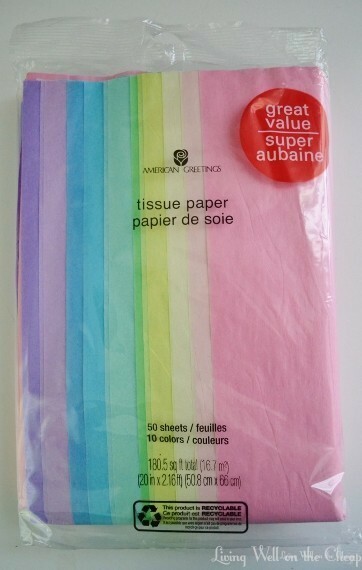 I started with this value pack of multicolored tissue paper I got for $5 at CVS. I pulled out several shades of green, blue, and yellow and lined them all up as neatly as I could. 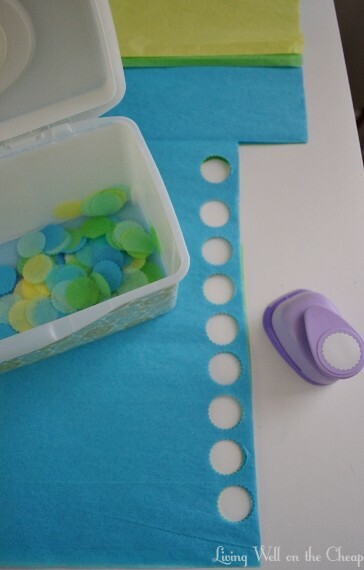 Then I just used this little circle punch I already had to start cutting big pieces of confetti. It was easy to just cut off the scraps and start a new row, working my way across the sheet. I dropped the confetti pieces into an empty wipes container as I went. How cute will these be scattered about on the food table? I also really like the idea of using decoupage to affix these to a canvas or piece of scrap wood or something to create some fun and modern art that’s perfect for a nursery or a particularly young feeling grown-up room. And I think the $5 price tag was totally reasonable for adorable oversized confetti in my choice of colors, plus I’ve got a ton of tissue paper left over for stuffing gift bags or using in other projects. 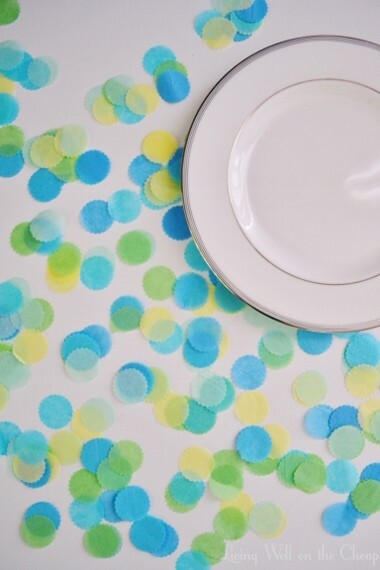 I might even use some leftover confetti to make some art for my laundry room–the colors are perfect. So that’s it for today y’all. I’m off to clean house and make groceries! Thanks for reading! ps also I forgot to mention yesterday–I’m now a part of the BlogHer publishing network! This is just another way for me to try to justify my blogging habit by making a little income. You see that ad on the sidebar to the right? I totally earned 59 cents yesterday because of it. Yay money! My sponsors’ ads are still there as well, they’re just a little further down the sidebar. If you’re interested in joining them you can get all the details here! How cute! If i ever decide to blog again, I’ll post pictures of my guest room where I used a similar technique. Oh, and CVS, has my heart. Love it! How much do you think the circle punch costs? I’m going to have to keep an eye out for a cheap one! Just looked back at an old blog post to check–it was $8 at Hobby Lobby. You could probably get it on sale or download their app to use a 40% off coupon! We just celebrated our baby’s first birthday in April. In a completely uncharacteristic stroke of genius, I asked my Dad if he would like to give Maggie the gift of his famous homemade ribs for the party — he brought the meat, manned the grill, and basked in the general adoration of the partiers; we provided the drinks, sides, and cupcakes. Not having to cook the meat took a big load off me. Love the confetti! 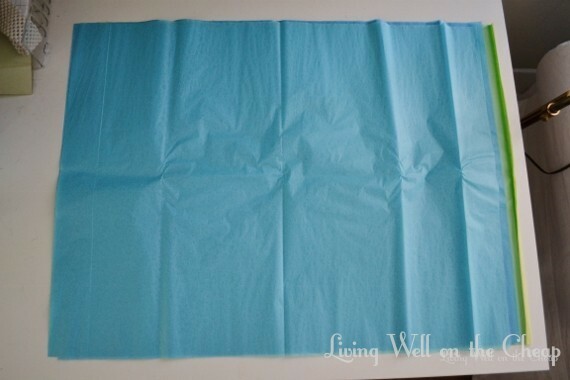 And love the idea of reusing it for something artsy to remember Jack’s party by. Gah why didn’t I think of that?!?!? So smart! 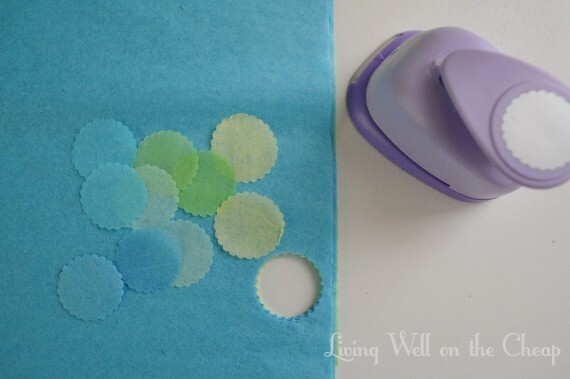 I love the idea of the confetti and making a work of art with it when finished. I also love that you are keeping it simple. Children’s parties are getting way out of hand with some obnoxious character theme etc. At one Jack will just have a good day and you will have some lovely memories and pictures. As he gets older, he will enjoy fun with a few friends. He won’t care if Mom gets in the coolest theme competition. I saw a parent who had a princess party for her 3 year old. The birthday girl was given a special crown bigger than all of the others. A crying fest ensued as all of the other three year old girls wanted the big crown. A theme is ok, but keep it simple so you can have fun too. I agree! Keep it simple.